The Transit Lounge is a comfortable 3 bed house, fully air conditioned with everything you will need for a short or long term stay. This is a family friendly house ideal for kids and pets it has a large yard, park and playground across the road. 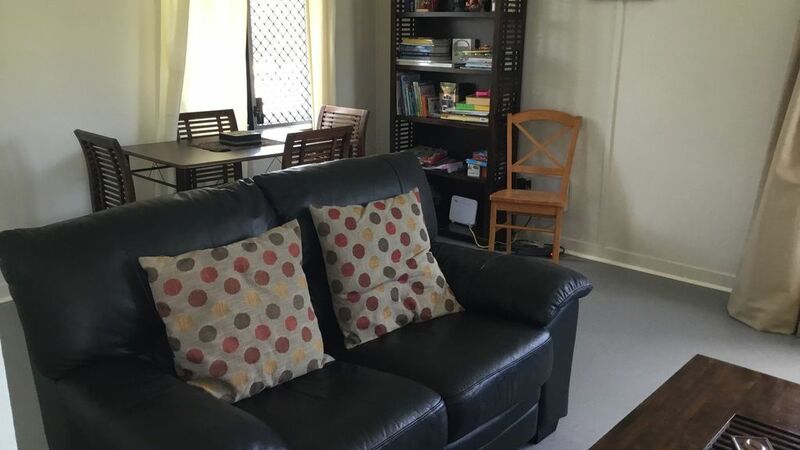 Ideally located three blocks from Bruce Highway so it it easy to access if you are travelling North or South. The house is three blocks from IGA, bottle shop, takeaway, bakery, video store and 500m from Townsville airport. The Transit Lounge has some modern upgrades, with new double shower and kitchen. There are three large bedrooms all with queen beds and one sofa lounge. The guest have access to the laundry and can park under the house if you want extra security. The yard is pet and child friendly with a secure fence. The house has unlimited wifi, DVDs player and games for the kids. We like to provide some breakfast goodies, tea, coffee etc please help yourself. people traveling with pets there is doggy bowls and blankets downstairs. Guests, there is a key box at the back door so you can check in anytime. Guest have full access to the house and yard. Just like its your own. We may not see each other but we will stay in touch via texting. We live close by so happy to pop over if you need anything.The transit lounge is a 1950s build designed to be cool by air circulating around the building. That is why the house is on stilts off the ground. We really enjoyed our stay here for the 4 days we were in Townsville. Quiet neighbourhood and a great yard for the dog to run around in. Was a comfortable stay 🙂 I will use again when I go back. Thoughtfully furnished, especially for people with fur babies. Nice location, close to parks and a fairly short drive to the strand. Highly recommended. Staying at this spacious and centrally located home was extremely rewarding. Being a short distance to airport, supermarket and main attractions was very convenient. The home had absolutely everything and more to comfortably house a family for any period of time. Great stay, very clean and convenient. Would definitely keep in mind for next stay.